This is so fabulous and filling! It’s a fun recipe too! Make the different parts of the bowl, line them up on the counter “bar” style, and let everyone choose their own ingredients, sauces, and toppings. Use vegan ingredients to make this truly vegan, or if you’re not concerned about that, add a little goat cheese, a dollop of Greek yogurt, or meat if you wish. This is a great option for everyone in your family because it’s so versatile. Just add and leave out whatever suits your dietary needs. Cook farro, or other grain, according to package directions. Feel free to use pasta in place of grains if you wish. Cover and set aside. Saute the zucchini, garlic, and onion in an oiled skillet until tender and slightly brown. Cover and set aside. Oven roast veggies of your choice by tossing uniform pieces of vegetables in a little olive oil, seasonings, salt, and pepper. I used cauliflower, chickpeas, and sweet potatoes. Place in even layer on large baking sheets, making sure not to pile or crowd veggies so they roast and don’t steam and get soggy. Place in preheated 425 degree oven for 20 to 30 minutes, watching closely and tossing them a couple times during cooking process so they don’t burn. Remove from oven. Cool a bit, and toss with the Dijon mustard. Place all in a large bowl. Using a wire whisk, mix until smooth. Pour into a canning jar, cover tightly, and refrigerate until ready to use. Shake covered jar well before each use to redistribute ingredients. Putting your Buddha bowls together: Place a bed of greens in each bowl. 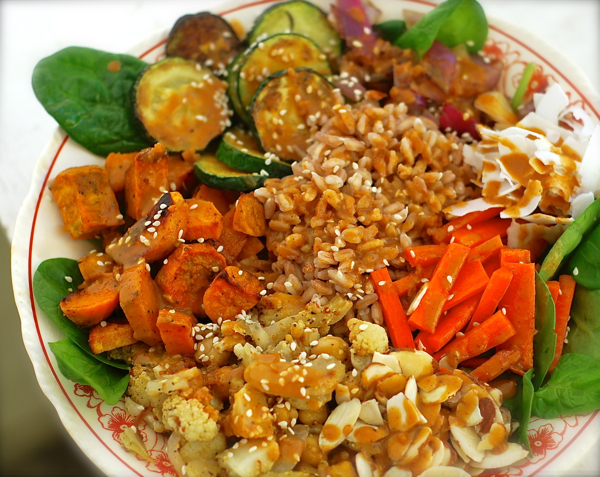 Top with grains or noodles of choice, some of the sauteed zucchini mixture, some of the Dijon oven roasted veggies, julienne carrots, almonds or other nuts, a sprinkle of coconut and sesame seeds, and a generous drizzle of the curried Buddha peanut sauce. Top with your favorite hot sauce. PS: You can assemble a bunch of Buddha bowls at the beginning of the week, they make great lunches and leftovers! Wonderful hot or cold!